The semi-finals were held in the third competition day of the Cologne Boxing World Cup in Germany where the winners are now finalists. India, China and Thailand all won key contests on Day3 proving Asia’s powerful background in Cologne. India’s Sakshi Choudhary and Thailand’s Wuttichai Masuk have done remarkable performances in the semi-finals. Cologne Boxing World Cup is one of the most difficult international competitions in the European continent which has started in Germany today. China, India, Mongolia and Thailand sent teams from the Asian National Federations to the Cologne Boxing World Cup in spite of the fact the ASBC Asian Confederation Boxing Championships will be opening next week. Cuba, Russia, Germany, France, England, Ireland, Wales, Armenia, Australia, and many other top nations are attending in the Cologne Boxing World Cup this week. Thailand’s Bunyanut Machai and Mongolia’s Erdenedalai Michidmaa both reached strong junior and youth results in the recent years. The two Asian women’s bantamweight (54kg) boxers are attending in the elite age group now and met each other in the semi-finals of the Cologne Boxing World Cup. Machai started slightly better but Michidmaa finished the first round with a tough left-handed hook. The Thai hope had excellent right and left hook combinations mainly in the third round and her excellent conditions delivered for her a place in the finals of the strong European event. India’s Sakshi Choudhary claimed silver medal in their National Selection Trials on March which was her first ever elite competition. Sakshi won the Taipei 2015 AIBA Women’s Junior World Boxing Championships, the Guwahati 2017 AIBA Women’s Youth World Boxing Championships and the Budapest 2018 AIBA Women’s Youth World Boxing Championships. The super talented teenager eliminated Denmark’s Cecilie Koelle in the quarter-finals and tried to keep her best range against Thailand’s Preedakamon Tintabthai. Sakshi landed more punches each of the round and eliminated her Southeast Asian rival in the semi-final of the event. The 19-year-old Indian boxer will be facing for the title with Ireland’s Commonwealth Games runner-up Michaela Walsh. Pwilao Basumatary attended in the international events already in 2011 and she had advantage in experiences during her semi-final against Denmark’s Ditte Frostholm. The Indian light welterweight (64kg) boxer reduced the fighting distance successfully and defeated her strong Danish rival by split decision. Basumatary will be boxing for the title of the Cologne Boxing World Cup with China’s Yang Chengyu who triumphed over Germany’s Maya Kleinhans in the second semi-final of the division. China’s top female team will be attending in the ASBC Asian Confederation Women’s Boxing Championships in Bangkok next week but their second squad is enough strong also to win key contests. Their National Champion at the welterweight (69kg) Yang Liu was too smart for Ireland’s Nanjing 2014 Youth Olympian Christina Desmond in the quarter-finals. The Chinese southpaw controlled her next fight against Denmark’s Yvonne Baek Rasmussen and kept her safest long distance. Yang Liu, who moved down from the middleweight (75kg), will be boxing for the title with Germany’s two-time AIBA Women’s World Boxing Championships bronze medallist Nadine Apetz. 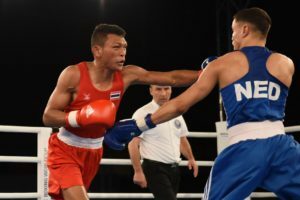 Thailand’s Wuttichai Yurachai attended in the Jakarta 2018 Asian Games and won the gold medal at the strong Galym Zharylgapov Memorial Tournament in Kazakhstan last December. He eliminated another Asian talent Zhang Jiamao in the quarter-finals of the Cologne Boxing World Cup. Yurachai tried to move closer to Germany’s Salah Ibrahim who used his longer reach in the first round of their semi-final. The German boxer’s game plan was to avoid the tough Thai attacks but Yurachai was enough quick to do this tactical mission. Thailand’s hope impressed in the third round and caught his German opponent more times. Yurachai played to the crowd as well and won the semi-final by split decision in Cologne. 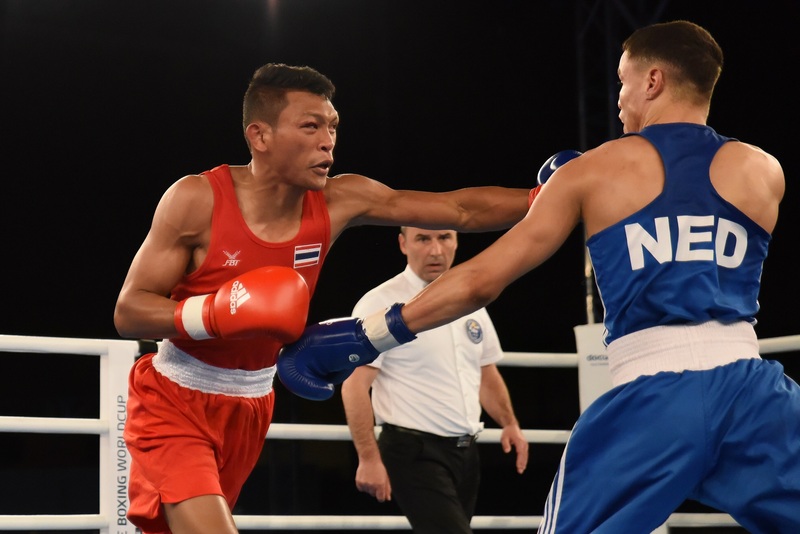 Thailand’s Wuttichai Masuk is Incheon 2014 Asian Games winner, ASBC Asian Champion and earned bronze medal at the Doha 2015 AIBA World Boxing Championships. Masuk returned in the Cologne Boxing World Cup with his best performance. He eliminated Germany’s Murat Yildirim and Denmark’s Frederik Lundgaard Jensen during his road to the semi-finals. Masuk felt the tempo also against Netherlands’ Rio 2016 Olympian Enrico La Cruz and marched into the final of the event.